the Philosophy of Visishtädvaita (visishta + Advaita). Komalathammal gave birth to a boy on Thursday, Dec 22, 1887, at 6 pm. On Jan 1, 1888 at the cradle and naming ceremony (Namakaranam), the baby was named Srinivasa Ramanujan Iyengar. According to a Hindu naming tradition, Srinivasa the boy’s father’s name would become the initial and Ramanujan his given name. Thus, his name is S. Ramanujan (and Iyengar, the caste name was never used). 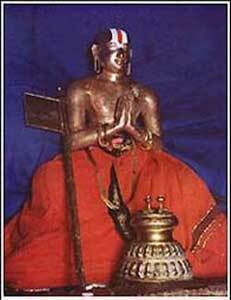 The Vaishnavite saint Ramanujachariar was also born on a Thursday. This perhaps was the reason for the choice of the name for the child. 'Advaita' means 'non-duality' or 'oneness'.